I always wanted to play this when it was released. It looked amazing, and I loved mythology, so an action game set across several eras of classic mythology sounded right up my street. It did come towards the back end of the C64's lifespan, though, and it never ended up coming into my possession. Perhaps that's just as well. I might have been disappointed with it then. It's not that it's a bad game - it's just very, very hard. 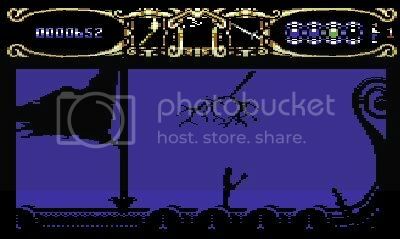 In fact, it's so hard that I couldn't get past level one off my own bat. Luckily, I'm playing this on an emulator, so I did get to see a lot of the game. And, thinking about it, I was probably better at playing games like this fifteen to twenty years ago, and a lot more patient, so I might have done better. But I've had my backside kicked a lot of times playing this game! I am a viiii-kiiiiing, I'm going out to waaa-aaaaar. Myth sees you cast as a modern day lad, thrown back into the realms of ancient mythology. You have to battle against Greek, Viking and Egyptian warriors and creatures in a battle possibly more epic than any before or since. It's certainly epic in scope... imagine a modern remake! A game with all those elements would knock God of War into a cocked hat. A film could have a lot of potential, too. Myth is a great looking game for its age (and platform) - there are some great effects (see the screenshot, which is part of a Viking thunderstorm), and the ancient beasts are pretty convincing. It's a shame that it seems to be so bone-crushingly hard... or maybe I'm just a bit thick, and can't figure out the puzzles as well as I should. It doesn't matter though... Myth has been a worthy trip back in time, in more ways than one.